After a lot of rumors, leaks, and speculation, Xiaomi has finally made the Mi Mix 2S official. A follow-up the to not-so-old Mi Mix 2, the 2S features a few upgrades such as a Snapdragon 845, dual cameras, Qi wireless charging, and more AI. It kept the global LTE band support and the nostril camera placement along the bottom bezel, as well as the same LCD as its predecessor. The biggest changes are the rear cameras and SoC bump. While the Mi Mix 2 is no slouch in terms of performance, its camera leaves a whole lot to be desired. Xiaomi has apparently stepped up its game with dual 12MP sensors, one wide-angle and the other telephoto, with 1.4μm pixels and a f/1.8 aperture on the main lens. In theory, this means that the Mi Mix 2S should perform much better than the Mix 2, especially in low light. 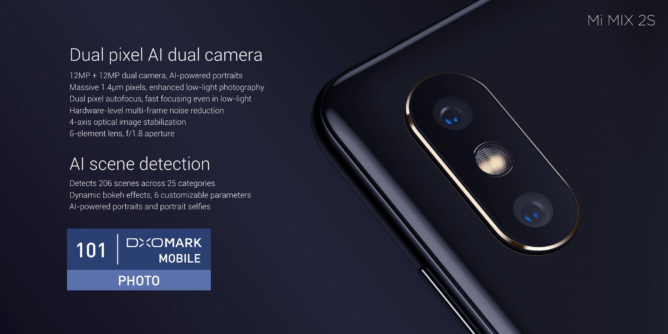 Xiaomi is also quite proud of the 101 photo score that DxOMark gave the newer phone. Many were hoping for a switch to an AMOLED display, but Xiaomi stuck with the same 5.99" 2160x1080 IPS LCD panel that we saw on the Mix 2. It's not a bad display, though MIUI tends to be a bit aggressive about over-dimming it. The Mi Mix 2S is available in 6GB+64GB, 6GB+128GB, and 8GB+256GB configurations for RMB 3299 (~$525 USD), RMB 3599 (~$573 USD), and RMB 3999 (~$636 USD), respectively. It will be available on April 3 in China from Xiaomi's website and physical stores, with more global availability coming later. Don't expect it to come to the States, though. SHANGHAI--(BUSINESS WIRE)--Global technology leader Xiaomi announced Mi MIX 2S today, a beautiful work of art that now comes with an exceptional AI dual camera and is powered by the latest Qualcomm® Snapdragon™ 845 platform. Xiaomi also upped its game in another key product line with the Mi Gaming Laptop 15.6." At the same time, it also announced a mini version of its wildly-popular Mi AI Speaker. Mi MIX 2S uses the latest Sony IMX363 flagship sensor for its dual-camera setup, with 1.4μm pixels for significantly better photos in low light, and Dual Pixel technology for super fast autofocusing. Mi MIX 2S also now comes with integrated AI features, including a built-in AI voice assistant to control the smartphone and smart home appliances. With up to 8GB RAM and 256GB ROM, Mi MIX 2S unleashes the full potential of the latest Qualcomm Snapdragon 845 for amazing performance. Mi MIX 2S continues Xiaomi’s commitment to making its innovations accessible to the widest possible range of consumers. Starting from RMB 3299, Mi MIX 2S will be available in China from 3 April onwards and will make its way to selected global markets at a later date. The unique design elements in the Mi MIX series have been recognized by some of the world’s most prestigious design awards and museums: National Design Museum in Finland, Center Pompidou in France, and Die Neue Sammlung in Germany, in some cases, marking the first time a phone has been added to their permanent collection. Mi MIX 2S continues evolving this design language, with a beautiful ceramic back that features a four-sided curved design, transitioning smoothly into the aluminum frame. Mi MIX 2S adopts the Sony IMX363 flagship sensor with 1.4μm pixels for its dual camera setup, letting in more light and resulting in significantly improved photos in low light and backlit scenarios. This sensor also uses the Dual Pixel technology, which was first used in high-end digital SLRs for much faster focusing due to having two photodiodes per pixel to calculate the light hitting the sensor. Combined with the noise reduction technology on the Qualcomm Snapdragon 845 platform, Mi MIX 2S is able to shoot high-quality pictures in a low-light environment with fast and accurate focusing. DxOMark—the leading and trusted source in the industry for camera and lens image quality measurements and ratings—gave Mi MIX 2S a 101 photo rating, the second-highest ever photo score for a smartphone camera. The integration of AI technology has also significantly enhanced the photo experience on Mi MIX 2S. With AI scene detection, the camera can intelligently optimize the image after it has been taken—for example, text on presentation slides can be identified so it remains clear even if you zoom in. Through a machine learning model based on hundreds of thousands of self-portraits, Mi MIX 2S is able to accurately distinguish between the subject and background, enabling precise background blurring. Users can then add dynamic bokeh to the photos taken in portrait mode, selecting from six effects in total. Mi MIX 2S uses the Qualcomm Snapdragon 845 chipset, manufactured using the latest generation 10nm process. With a maximum clock speed of 2.8GHz, the new Kryo 385 cores see a 30 percent performance increase over the last generation. Qualcomm Snapdragon 845 also features the new Adreno 630 graphics, which gives up to 30 percent higher performance and up to 30 percent lower power consumption. In addition, Qualcomm Snapdragon 845 also features cutting-edge on-device AI processing, delivering 3x improvement in overall AI performance compared to the prior generation. With up to 8GB RAM and 256GB storage, Mi MIX 2S achieved a score of 277,178 on the Antutu benchmark. Connectivity-wise, Mi MIX 2S (8GB + 256GB) supports 43 global bands so you can use it anywhere in the world. Mi MIX 2S also now comes with AI-integrated features, including a built-in AI voice assistant to control the smartphone and smart home appliances. Covering six categories with nearly a hundred voice commands, users can remotely control their smart home appliances, or find a photo based on location or time, with just a simple voice command. On 23 February 2018, Xiaomi announced that it became one of Google’s ARCore partners. Mi MIX 2S is now Xiaomi’s first device to support ARCore apps, bringing an amazing AR experience to more Android users both in China and globally. “The Machines,” which has been touted as the future of AR games, is making its exclusive Android debut on Xiaomi. Mi MIX 2S also supports 7.5W fast wireless charging. Along with this, Xiaomi is launching a RMB 99 (US$16) wireless charging pad, which is bundled with the 8GB+256GB version, or available as a separate accessory. Mi MIX 2S is available in 6GB+64GB, 6GB+128GB and 8GB+256GB for RMB 3299, RMB 3599, and RMB 3999 respectively. It will be available starting 3 April at 10am from a range of retail channels including Mi.com and our Mi Home stores.